We’re sure that several rooms in your home probably have tile flooring. Tile can seem easy to clean by just sweeping and mopping it occasionally. However, tile requires more in-depth cleaning to prevent bacteria, grime, and other dirt build-up. If your grout is discolored, it’s time to schedule professional tile cleaning. You could get down on your hands and knees and scrub all of your tile floors clean, but it won’t be ever be as thorough as a professional. Our Chem-Dry technicians are trained on how to adequately clean tile, grout, and stone. As a part of every cleaning, your certified Ace Chem-Dry professional will apply a coat of durable sealant to your grout after it is thoroughly cleaned. When our trained staff applies the sealant, a barrier is created and it minimizes the amount of dirt that is able to creep into the grout pores. This helps your grout stay cleaner, longer and maintenance is simple because dirt can longer penetrate deep into the cracks. Schedule A Tile Cleaning with Ace Chem-Dry Today! We can clean and seal your tile and grout flooring on the same day! 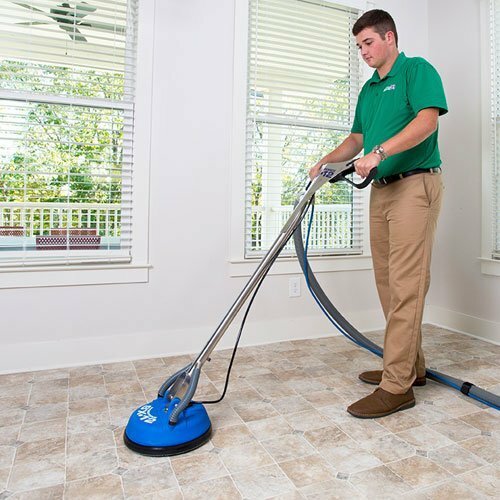 Your freshly cleaned floors will be able to tolerate light traffic in as little as a few hours. With our tile cleaning service, you can be back on your floors and living your life in no-time. Ace Chem-Dry works hard to ensure our services cause the least amount of disruption to your busy schedule and home life while still giving you the most effective clean. Our technicians have the training, knowledge, and experience to evaluate your tile and grout. They identify your needs and select the proper products, tools, and equipment to deliver a result that will exceed your expectations. We provide industry-leading residential & commercial carpet & upholstery cleaning services in Larimer County & Weld County, Colorado, including: Greeley, Loveland, Fort Collins, Windsor, Arrowhead, Timnath, Severance, Kelim, Campion, Johnstown, Garden City, & the surrounding areas. © Ace Chem-Dry 2019. Independently owned and operated in Greeley, CO /// Site designed by Kite Media.